Good military leaders are an extremely valuable resource. That is doubly-true for one that has commanded battles for over two centuries. The experience and tactics in the mind of a commander like that can almost ensure victory right from the start. Well, Xan Tu had such a life. Now, he's transferred his consciousness into a drone body, letting him continue to lead Isorian forces long after his mortal form has turned into worm food. You can order yours for Beyond the Gates of Antares now. 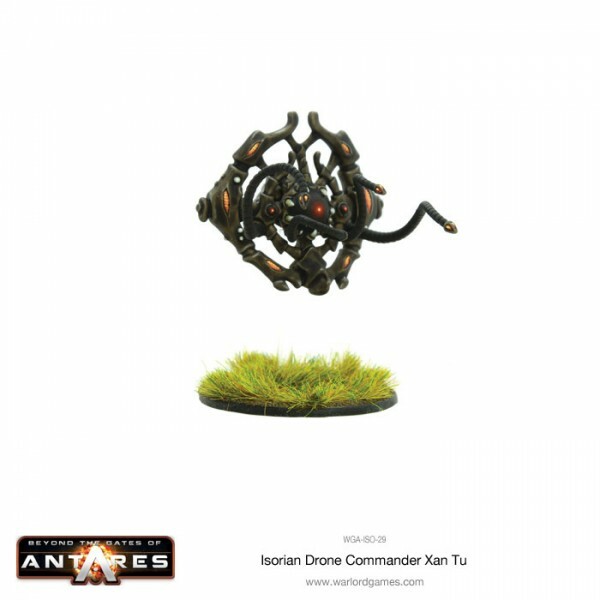 Xan Tu works well with both living and nonliving models on the field, owing to the fact that he once was alive, but is now a drone. His drone, itself, is unarmed, but you can give him the Nano Probe Net upgrade so he can interface more directly with the drones around him. He's very much a "command other units to greatness" sort of leader, rather than running right into the enemy as the spearhead of a charge.